I arrived home from my adventure to New York with Tank and Reggie late Saturday night. Knowing I would be tired on Sunday, I didn't set out to accomplish too much. I DID plan to get something done though. I mentioned to Coach before I left for the airport on Thursday that the internet connection was becoming a headache. I could get online, but I could expect to lose that connection without warning. CONSTANTLY. It was definitely annoying. I suggested that it might be time to replace our modem. how to make them function properly. First of all, the fact that I can even locate a modem and turn the power off and on in order to get online is nothing short of a miracle. 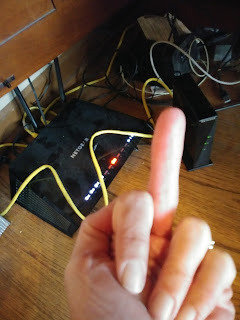 When I'm not flipping the modem off, I am literally flipping the power source off and on. It usually works - the power source thing, not my obscene hand gestures. Sunday morning, I used the computer a bit before Coach got started setting up the new modem he bought. I didn't have time to post anything, but figured I'd just do it when he was done. How long can it take? Since he was busy taking one for the team with modem setup (which included wires and plugging things in and hooking things up - yuck), I became the available kid chauffeur. I gladly drove Reggie over to his buddy's house to avoid computer stuff. I wasn't back 15 minutes, before I got a call that Reggie was getting dropped back off at my house. He ran into a pole. This was a new one. Reggie and his friends decided to spin around 20 times and then run as fast as they could towards a pole at the park to see who could get there first. Sounds like a great plan if you are 11 . . . and stupid. I guess being 11 and acting stupid goes hand in hand. Reg won the challenge. I can't say I'm proud. His win may not have counted because the side of his face collided with the pole. He laid on the couch with ice on his face and fell asleep. I was a bit concerned that he might have a concussion, but he wasn't dizzy and didn't feel like he was going to throw up and his pupils matched one another. This kid gave himself a concussion when he was 3 1/2 by building a tower out of toys and small furniture in the basement, scaling his creation, and falling off of it. On his head. Coach is more of an expert at doing a concussion assessment because he is a physical therapist, but he was now on the phone with AT&T. The modem installation wasn't going well. When Coach finally surfaced, he was surprised to see Reg sleeping. I reminded him that our trip to New York was exhausting and Reg was probably tired. When I took the ice off of his face, he woke up. We sent him to nap in his bed. We agreed to wake him up in a bit, so that he could watch his flag football game . . from the sidelines. No playing. Bummer. I took a nap too. Despite getting a good night sleep in my own bed the night before, I was still exhausted. Shortly after my snooze, a frustrated Coach called me into the study. It was my turn to take the reins in the modem nightmare. Coach had to prep dinner that he was going to grill. AT&T decided that there might be a problem with our line. They are scheduled to come out to the house on Thursday to check it out. In the meantime, Coach attempted to set up the modem and was on the phone with Netgear. He was super frustrated. I couldn't believe that this was still dragging on. envisioned staring at for HOURS! I won't bore you with details, but here a few interesting notes: the person I was on the phone with told me to call AT&T back because they must have given Coach the wrong login and password. She was correct - wrong password. 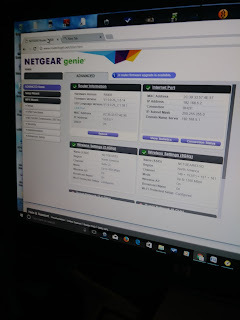 When I called Netgear back with the right password the woman instructed me to hang up so she could call me back. She never called. The next guy had me try a zillion things. No luck. I passed the time while we waited for screens to update and pages to open by shopping for a kitchen table and chairs on my smartphone. Browsing the web for furniture had been on my list. I had hoped to have access to a larger screen. Two hours later, he suggested that I go back to the store and trade the modem in for a new one because it must have been faulty. Seriously? Coach kept asking why the basic setup instructions that came with the modem wouldn't work. We both suffer from extreme cluelessness when it comes to computers, but we were following all of their instructions. I hung up with our 3rd Netgear consultant and drove Tank to a meeting. Coach raced to Best Buy to swap out the modem. We had planned to drive Reggie to his basketball clinic, but he admitted that he still didn't feel well enough to play a sport. (Side note: Reg has NEVER passed up a chance to play a sport.) This was the last clinic in the not-so-cheap series. Between Coach and I our frustration level was measuring off the charts. An explosion was imminent. 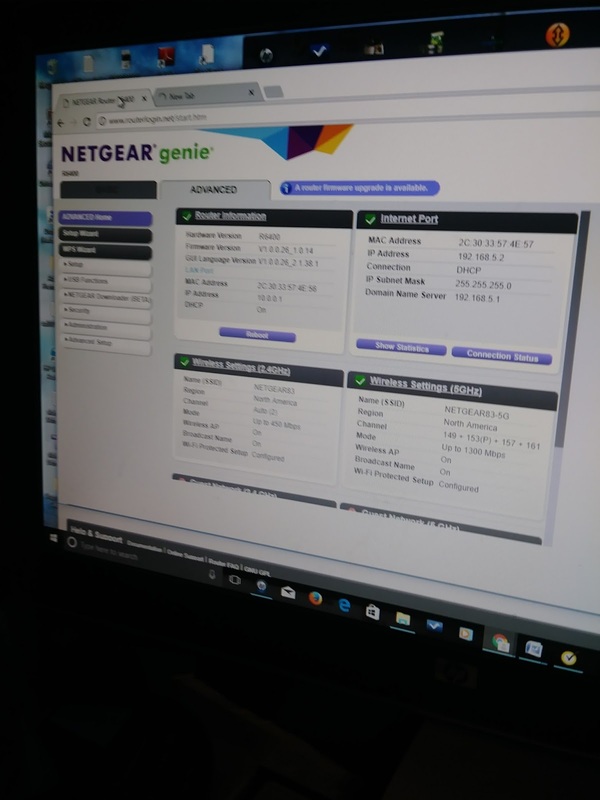 Coach called Netgear back. The new modem wouldn't connect the traditional way. Hours later, he joined the kids and I in the basement where we were watching our back logged 'America's Got Talent' show. Coach shook his head. He was able to get the modem working. It had literally been an all day nightmare project. Do NOT get me started on AT&T...although I must admit my last call to them on Monday, I think, was the best experience I've ever had. That being said, I think they are messing with our service so that we will move up to the next level.